In the post Users vs. Accounts vs. Signer-Uppers I talked about how there’s a difference between the people who just sign up for a service, and the people who actually sign up and continue to use that service. 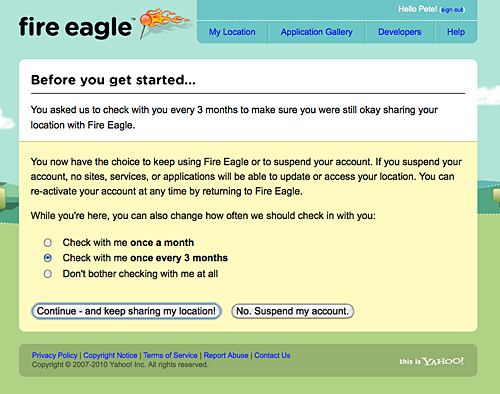 My suggestion was that a service should check in with you by sending you a reminder to see if you still wanted to use it and keep your account active. I’m not sure if the Fire Eagle team got the idea from me, or came up with it on their own, but either way, I was happy to get an email from them which led me to the question you see above.